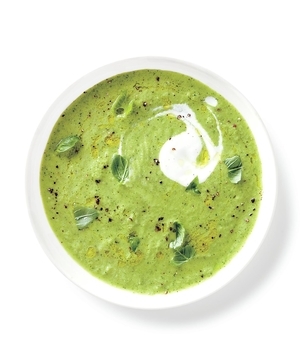 Puree the scallions, cucumbers, zucchini, oil, basil, and lemon juice in a blender until smooth. Add the yogurt and 1 teaspoon each salt and pepper and pulse to combine. Serve topped with additional yogurt, torn basil, and pepper. Drizzle with olive oil. Purchase some vegan yogurt. There are many different brands on the market. Find something plain.